Remove the neck and giblets, rinse, pat dry and place in a roasting pan. Warm up the butter/herb mix, just slightly. I put it in the microwave for 8 seconds...it's just enough to soften the butter mix so you can rub it on the turkey. Place the turkey into the oven and immediately TURN DOWN the heat to 350 °F. 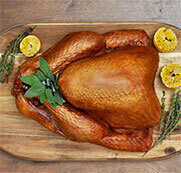 Roast for 35 - 40 minutes per 2 lbs, so a turkey of this size will need to roast for approximately 3 to 3 1/2 hours. 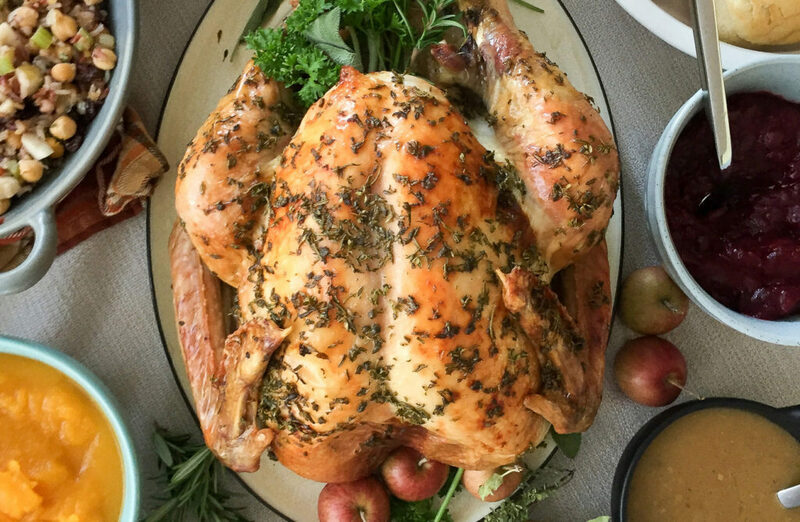 The turkey is done when the thigh meat reaches an internal temperature of 165 –170 °F. When the turkey is done, remove it from the oven, and place it on a large plate (keep the pan drippings! ), then cover it in tin foil and let rest about 15 - 30 minutes, and make your gravy. Take the pan drippings and pour them into a saucepan or large skillet. You should have about about 2 cups of drippings. If you don't, you can use extra turkey broth. If the gravy separates, add more turkey broth and flour and whisk until smooth. Taste the gravy then add salt and pepper to your taste preference.